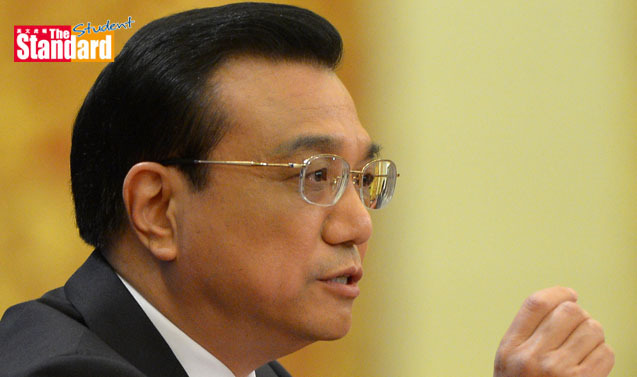 THE principle of “one country, two systems” must comply with China’s constitution and Hong Kong’s Basic Law (基本法), Premier Li Keqiang (李克強) has said. Li was delivering a 38-page government work report at the opening of the annual National People’s Congress (NPC, 全國人民代表大會) in Beijing (北京) last Thursday. It was the first time the national constitution in relation to Hong Kong has been mentioned in the work report. “Hong Kong people governing Hong Kong” and “a high degree of autonomy” were also mentioned in Li’s concluding remarks. They were noticeably absent last year in his first report as premier. “The central government will steadfastly implement the principles of one country, two systems, Hong Kong people governing Hong Kong and Macau (澳門 ) people governing Macau, and both regions having a high degree of autonomy,” Li said. “We will strictly comply with the national constitution and the basic laws of the two regions. Hong Kong Baptist University (香港浸會大學) government and international studies professor Michael DeGolyer said Li was reflecting an elevation of Hong Kong as an area of national interest, particularly after Occupy, while reiterating the one country, two systems relationship. City University of Hong Kong (香港城市大學) political scientist James Sung Lap-kung (宋立功) said the reference to the national constitution shows Beijing is concerned about the rise of “localism” in Hong Kong. Legislator Alan Leong Kah-kit (梁家傑) of the Civic Party (公民黨) welcomed Li underscoring the principles of Hong Kong people governing Hong Kong, but thought “adherence to the national constitution” placed more emphasis on one country than on two systems.